"Aggressive Inline" redirects here. For the 2002 video game, see Aggressive Inline (video game). Aggressive skating (referred to by participants as rollerblading, blading, skating or rolling) is a sub discipline of inline skating primarily focused on the execution of tricks in the action sports canon. Aggressive inline skates are specially modified to accommodate grinds and jumps. Aggressive skating can take place on found street obstacles or at skate parks. Since 1994, the sport has been chronicled in various skating films and "edits." In 1980, a group of ice hockey players in Minnesota were looking for a way to practice during the summer. Scott and Brennan Olson formed the company Rollerblade, Inc., to sell skates with four polyurethane wheels arranged in a straight line on the bottom of a padded boot. In 1988, Rollerblade introduced the first aggressive inline skate, the Rollerblade Lightning TRS. Aggressive inline skating finally developed as an organized sport in the early 1990s. In 1994, the first ever competition series was launched on the beaches of Southern California by two childhood friends turned promoters Rick Stark and Mark Billik. The event was called The National Inline Skate Series better known as NISS to aggressive skaters around the world. Their company Anywhere Sports Productions sold Taco Bell on sponsoring the series for $150,000 and a six stop series was born. Chris Edwards and Arlo Eisenberg were the eventual champions of the 1994 series. NISS, went strong for 5 years holding contests in Los Angeles, New York, Rome and Brazil. NISS, was the first series to put aggressive inline on TV with an ESPN deal for the 1994 series and later moving the competition series to PRIME TICKET-Fox Sports. The Aggressive Skaters Association (ASA) was formed by a number of aggressive inline skaters in 1995 as a forum to develop rules governing competitions and equipment. The sport was included in the first ESPN X-Games in 1995 and included vertical ramp and street event competitions. It reached its height in popularity in the late 90s, with mainstream movies like Disney's Brink! and other films. The "Senate" brand, run by Arlo Eisenberg and several other prominent skaters, was very popular during the 1990s. Founded by company owners/skating legends Brian Shima, Jon Julio and Kato Mateu and supported by all major skate companies, the World Rolling Series (WRS) links together the best skaters, event organizers, retailers and skate parks and aims to "create a tighter knit community, increase overall awareness and set a higher standard for aggressive rollerblading." The WRS circuit started in 2009 with 10 established professional contests in France, Netherlands, England, Spain, Argentina, Australia and the United States. In 2012, WRS now includes 100+ Amateurs and Professional events categorized from 1 to 5 stars in over 20 countries. Aggressive inline skating was removed from the ESPN X-Games in 2005 although it is still included in the Asian X Games, LG Action Sports Competitions, Montpellier Fise, and many other large competitions, some associated with WRS, some not. Current aggressive inline skate manufacturers include Remz, USD, Them Skates, Razors, Rollerblade, K2, Roces, Seba and Trigger. In street skating, also known as freestyle skating, the skater performs tricks by utilizing features existing in a common, everyday environment. This involves skaters grinding hand rails and concrete ledges, jumping stairs, ramping off of embankments and generally turning anything on the regular street into an obstacle, ramp, or grind rail. Creativity is often seen as an important aspect of street skating, since skaters are able to invent or link tricks specific to a unique environment, rather than performing more standard maneuvers on predefined obstacles as in park and vert skating. Park skating refers to skating that occurs in various private and community skateparks. This style differs from street skating due to the specific nature of skate parks, which are designed for skaters to do tricks, e.g. on the top of the ramp (coping). Park skating often emphasizes the technical side of aggressive inline, focusing on the variety of tricks a skater can do and encouraging skaters to connect tricks. A series of tricks connected together in a fluid motion over different obstacles is known as a line. Skate parks often feature quarter pipes and half-pipes, curved ramps and other features that are not usually found in a regular urban setting. A better quality skate park will have good lines—making it easier for skaters to perform tricks. Good skateparks have a flow to them. Vert is an other discipline of inline skating. It mostly consists in air tricks, such as rotations and grind tricks on coping. In this type of skating some of the most famous names are the Yasutoko brothers, Taig Khris as well as many others. A pair of Chris Edwards Chocolate aggressive inline skates. This is an older model, which uses grind plates instead of an H-block. Aggressive inline skates are specially designed to be tougher and stronger than normal inline skates, due to the high levels of stress placed on the skate by the stunts and tricks a skater performs. A typical skate consists of a number of different parts. Typically each part is replaceable, and certain manufacturers provided parts that have been divided into individual sections, so a skater can replace specific worn areas. The chassis of the skate, called the frame, bolts to the bottom of the skate. Skaters grind on the frames, which are designed for this purpose. Sometimes they plant the outer frames horizontally on a rail or ledge surface to execute so-called topside grinds. There are several different variations on frame design. Originally a skate had four wheels on each skate, with a gap between the middle wheel where a plastic insert called an H-block was used for grinding. During earlier times, a plastic plate, known as the grind plate was attached to the frame on the outside of the two middle wheels instead of an H-block. 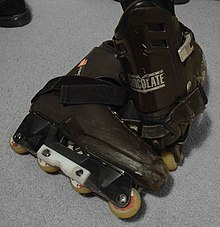 This allowed normal recreational skates to be converted into aggressive skates, and it was how most aggressive skates were built at the time. On aggressive skates with H-blocks, the grind plate could be used to increase the life of the H-block. But as frame manufacturers began making removable H-blocks, the grind plate fell out of favor. As the sport evolved, skate companies started manufacturing wheels that were intentionally hard and undersized, in order to facilitate grinding. The undersized wheels are called anti-rockers, and replace the two middle wheels. Generally, there are three different types of modern frames: flat, anti-rocker, and freestyle. Flat, as described above, means you have four wheels per skate. There is another variation of this called the Hi-Lo setup. This means it has large outer wheels, but small inner wheels to make grinding easy. The inner wheels' axles are closer to the ground so that all the wheels touch the ground. Anti-rocker, as also described above, is the most popular setup. Freestyle frames have no inner wheels, giving the user a large amount of space in the middle for grinding. Another setup that's gaining popularity, called tri-rocker, means that there are three wheels per skate. The remaining axle hole is left empty or replaced with an anti-rocker wheel. This combines the benefits of a flat setup (going fast and turning easily) with the benefits of an anti-rocker/freestyle setup (grinding easily). The frame company Create Originals makes frames that are meant for tri rocker to be a possibility. In the late 1990s, the Universal Frame System (UFS) was introduced by frame manufacturers to allow the user to easily customize their skates. This led to increased customization of skates within the sport by allowing the user interchangeability between different companies' frames. Today, all major frame and skate manufacturers support UFS. Modern skate wheels have undergone many years of development and iteration. The development of the main material, polyurethane (usually simply called urethane), has been dependent on advancements in the polymer industry. The balance between hardness and grip is the key to an optimum skate wheel. Aggressive skate wheels are usually between 54 and 72mm, while anti-rocker wheels are between 40 and 47mm. Two high density polyurethane or plastic wheels between 40 and 47mm, replacing the inner two wheels. The name is derived from the nature of flat(rocker) setups to "rock" (become unstable) over concave or convex surfaces. Eliminating the center wheels eliminates the instability by reducing the number of contact points the skate has with the ground. Having only two wheels on a frame ensures that any weight on that skate will be distributed 50/50, front to back. Some skaters prefer replacing only one of the inner wheels with anti-rockers (called tri-rocker). Anti-rocker wheels enable skaters to grind obstacles with a relatively high diameter. These wheels unlike "normal" (larger, softer) wheels, give skaters the ability to approach obstacles in ways they might not be able to otherwise. This depends on boot dimensions/style, frame dimensions/style and skater dimensions/style. While larger wheels leave less of a gap between them, the smaller anti-rocker wheels bring the surface of the edge being grided closer to the frame. At the same time the added space between the center wheels, allows for the entire skate to be angled farther forward for a more centered position over the edge. The lower coefficient of friction slides faster than that of a softer wheel, so it may unobstructively rest on the horrozontal surface(s) of the obstacle, allowing for the afore mentioned angle/position of the boot/skater while grinding. This is an angle that may be impossible to achieve with certain frame/flat(rocker) combinations on certain obstacles. An anti-rocker setup would be used at the skaters discretion, based on the terrain they planned to skate, and way they wish to skate it. One disadvantage of an anti-rocker setup is the speed that is lost, as four load bearing wheels are removed, and the weight distributed to each of the remaining is increased. Skate videos began in 1994 with the release of The Hoax: An In-Line Crime. K2 Sports, Salomon and Rollerblade were early proponents of the sport and released their own videos. Senate, arguably the first inline-only company, released a number of influential films during the 1990s. Videogroove, Mindgame, Razors, KFC, and Valo released a number of notable films during the early 2000s. During this period the genre transitioned from VHS to DVD like much of the rest of the entertainment industry. They have similarly transitioned to the digital format since the 2010s. Skate videos, like their skateboarding and BMX counterparts, feature skaters both professional and amateur, in "edits," segments of skating usually accompanied by one or more songs. Music is often used without permission. Alternatively, original music is sometimes created specifically for the film. A 2006 documentary, Barely Dead, gives an overview of skating, focusing on its popularity and decline. ^ "WRS - About". Retrieved 27 August 2015. ^ "Inline No Longer X Games Competition". March 8, 2005. ^ "Aggressive Skates". Retrieved 27 August 2015. ^ "VENICE : Event Helps Skaters Get All In-Line". latimes. Retrieved 27 August 2015. McKenna, Anne (1999). Aggressive In-Line Skating. Capstone Press. ISBN 0-7368-0164-2. Murdico, Suzanne (2003). In-line Skating: Techniques and Tricks. Rosen Publishing Group. ISBN 0-8239-3844-1. Weil, Ann (2004). Aggressive In-Line Skating. Capstone Press. ISBN 0-7368-2708-0. Wikimedia Commons has media related to Aggressive inline skating. Look up in-line skating in Wiktionary, the free dictionary. This page was last edited on 10 February 2019, at 19:53 (UTC).